I have 3 adjacent rectangle as shown belown. I have 2 simple questions based on that. 1 - In this picture, selected area has 2 paths on top of each other. how i can make them one? 2 - In same picture again, selected area has 3 different paths.They just touching each other by a node. How i can make them one single path again? As already commented, you want something not possible. Every shape has it own nodes and stroke. 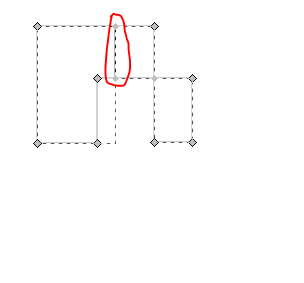 In addition a path, where a single node has 3 or more branches, is nonexistent in Inkscape. You can draw everything easily with the pen if you have a grid for snapping or if you use point snaps and have a locked copy of your original attempt in the bottom. If you want handle the black version as one, you can make a group or combine the paths. 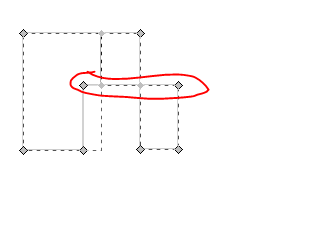 The latter is mostly used to make holes to closed shapes, but one can also make a combined path which keeps several non-overlapping paths together.